Sea Belles A Cappella Chorus, Saint John, N.B., chapter of Harmony, Incorporated, an international organization of female a cappella singers specializing in the barbershop harmony style, recently earned regional recognition as second place Atlantic chorus and qualified for a spot at Harmony, Inc.’s international competition, which will be held later this year in Halifax, Nova Scotia. 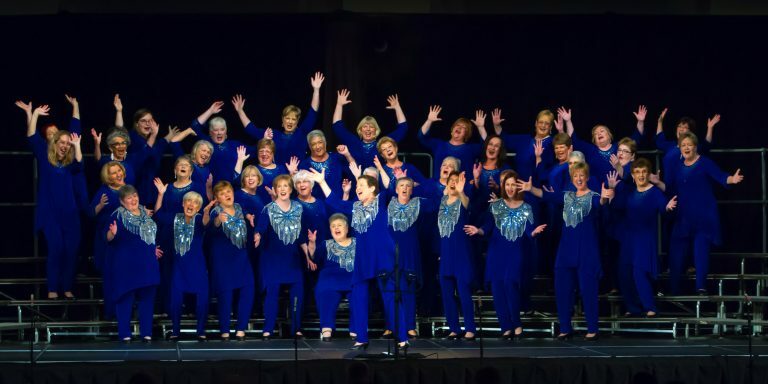 Sea Belles, based in Saint John, New Brunswick, placed second out of six choruses in Harmony, Inc.’s Area 1, which includes New Brunswick, Nova Scotia, Prince Edward Island and Newfoundland. This competition took place in Sackville, N.B. June 1-4, and participants earning a score of a certain threshold qualified to participate in the international competition of Harmony, Inc. choruses in November. Two other choruses and three quartets also qualified for the November international contest, including Fredericton’s Elm City Echoes Chorus and Gotta Sing quartet. With approximately 55 members, Sea Belles is directed by Darlings Island resident, Janet Kidd. The chorus presented two new songs at the area contest to earn its placement- the ballad, If You Love me and an uptune, The Joint is Jumpin. These selections are a small sample of the chorus’s extensive repertoire, which is ideally suited for a wide range of audiences and events. To learn more about the chorus’s performance schedule, visit www.seabelles.ca.